British forces have detained 12 people, including three police officers, in connection with a series of deadly attacks on UK forces in southern Iraq. Brigadier John Lorimer said the raid, in Basra during the night, was aimed at stopping the surge in attacks by local militia on allied troops. "This terrorism must be stopped, we have a right to protect ourselves and innocent citizens," he said. Some of the 12 are said to be followers of radical Shia cleric Moqtada Sadr. This comes two weeks after UK armoured vehicles destroyed the walls of a Basra police station, sparking protests. The BBC's Caroline Hawley, in Baghdad, said sources told her the arrested officers were from the same Basra police station. Brig Lorimer said in a statement: "Some of the individuals we have arrested are linked to militia groups in Basra. Some of the individuals are members of Basra Police Service. "We have acted against them solely because they are involved in terrorism, not because they are members of any particular political group or organisation." The brigadier said it was "very concerning" that police officers were involved in terrorism", adding "nobody who has been involved in murdering soldiers should be allowed to hide behind their uniform". 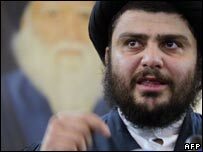 Members of the Mehdi Army, the name given to Mr Sadr's supporters, have told the AFP news agency that all of the arrested men were followers of the radical cleric. Mr Sadr has long opposed foreign troops' presence in Iraq. Sources said no shots were fired as the men were detained after soldiers raided a house. In September, two British soldiers who were believed to be working undercover, were arrested by Iraqi police. 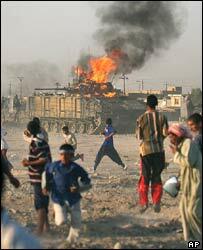 UK troops later used armoured vehicles in an attempt to free the pair, causing anger among locals in Basra. The ensuing clashes saw armoured cars being surrounded by mobs and set on fire by petrol bombs. Three soldiers were injured in the clashes - none seriously - and two civilians were reportedly killed. Seven British soldiers have been killed in a spate of attacks involving roadside bombs since May. Meanwhile Lord Boyce, who was UK chief of defence when the Iraq War began, has called on the media to cover more good news stories from Iraq. "[The media] should try to report a good story every week. The challenge wouldn't be to find one - they are out there - the challenge would be whether the media as a whole couldn't actually do it." He said it would be a "morale boost" for the country as a whole.